This show, self-described as “modern vaudeville,” combines technological elements like projected animation and LED screens, old-fashioned comedy and magic routines, as well as music made with pipes. And, of course, all this is presented by three hairless, earless Blue Men, or rather one Blue Man, played by three actors. The three raceless men wander around the audience, exploring the world around them as if they’d never seen it before, staring into the eyes of audience members, trying to find a connection. The show, an entertainment extravaganza, builds to a totally 90s party atmosphere, an exploration of how humans communicate and relate in a world of mass media, information overload and cyber saturation. My favorite part of the show is when the characters try to find a password to get into a big cellphone on the stage. That part of the show exemplifies how they are not well adapted to the new world, where technology reigns everywhere. Also remarkable is how they connect to the audience in a pure and innocent way. Today with so much technology, we need connection and love in the theater more than ever. Their use of drums and musicality is really unique. It’s hard to describe the Blue Man Group, but one thing is sure, they “bring light and hope to families.” A Brazilian boy sitting next to me was saying to his mom that he wanted to sleep at the start of the show, but he enjoyed it so much and was so happy and excited at the end. 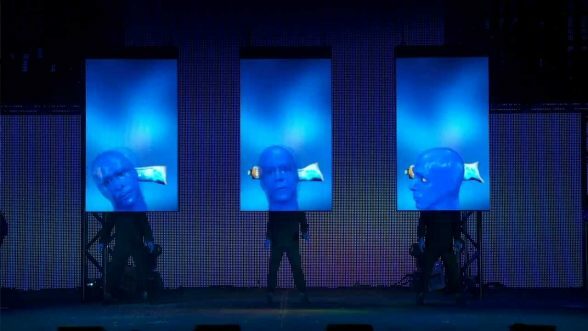 Blue Man Group is a treat. It’s an event, and it’s enthralling. This show presents lots of spectacle, but with lots of thought put into it as well. Perhaps most importantly, it’s the kind of show that makes people that don’t usually attend theater get out and buy tickets. Everyone wants to see Blue Man Group, the same way that everyone wants to see a big summer blockbuster. The fact that this show manages to create such sparkling entertainment, while still respecting its audience’s intellect, makes it one of the most notable theatrical feats of the 90s, 2000s and beyond.